An interesting bird showed up at the Lee & Rose Warner Nature Center today during banding. There were three juncos in a net. One was male, one a female and one didn't seem quite right. 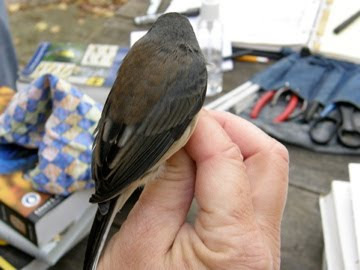 There are a number of different types of Dark-eyed Juncos in North America. The ones we commonly see in Minnesota are the Slate-colored variety. They are essentially all gray on top and white on the bottom. If you look carefully though you can distinguish males and females as the females are slightly brownish gray on the back while the males are more pure gray. What caught everyone's eye about the third Dark-eyed Junco, the one in all the photos here, was that the back of the bird seemed very brown but the head did not. In fact, there is no brown on the head whatsoever. The head also seemed to be darker than the rest of the bird but not extremely so. Our first reaction was to consider calling this an Oregon Junco. The complete lack of brown on the head makes us think male but then again it isn't as dark a black as one would expect. What this comes down to is that there are a lot of intergrades when it comes to Juncos and it can be hard to draw a clear line between different sub-species. 1) No brown on head but clearly brown across back, brown extends slightly onto wing. Possibly an intergrade with a Cassiar form? Or possibly within the range of Slate-colored variation for this pesky species? Way beyond my expertise at any rate. I note that there's a drawing of a bird with a convex bib in the set of drawings of Slate-colored variations on the second Ocean Wanderers page, just to confuse the issue even more. It looks like a late summer (worn) version of the Oegon (thurberi) in my Nat Geo Complete, or it could be a hibred between a Slate Colored and an Oregon. Very interesting! I'm from Victoria, BC (but originally from Ontario where we saw the slate-coloured) YOur bird dos indeed look liek the Oregon, however with a bib that large I would expect it to be black, and be a male! there are so many variations in the grey hood out here-but I dont' believ I've seen one quite like yours! Danielle M.